On September 21, 2017 about 150 to 200 women were stopped by police on their way to Pujehun to urge local authorities to take action against the Luxembourg-based oil palm plantation company SOCFIN for grabbing their lands and committing other related human rights abuses. The women were travelling from Malen Chiefdom and were stopped by road blocks set up by the police at Benga Junction, about 4 km outside of Pujehun, the capital of Pujehun District, Sierra Leone. The police instructed the women to return to their homes but the women stood their ground and refused to go back. The women displayed banners and placards condemning land grabbing and the rampant arrests, detentions and trials of landowners from their area, and called for peace as the best option. They were interviewed by several journalists who arrived on the scene. After about 3 to 4 hours, they reluctantly returned home but six of them continued to Pujehun to attend a meeting of key stakeholders (a “district security meeting”), which the women described as very successful. The women had earlier written letters to key district stakeholders requesting a meeting to discuss the land crisis and related human rights abuses in Malen. The women maintain that they, and their children, have faced untold hardship and suffering since SOCFIN grabbed their lands. 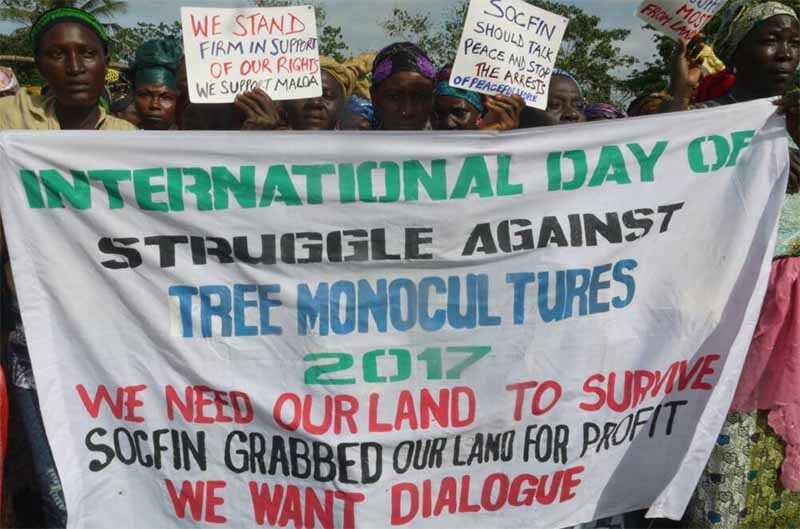 They chose September 21st, the International Day of Struggles against Tree Monocultures, to call for dialogue and to raise public awareness on their ordeal in Malen, a situation some say is a broad daylight land theft. The Pujehun Police saw reason and abandoned an earlier plan to arrest the Spokesman and other leaders of MALOA, including some women as any arrest of peaceful protesters would have undermined the efforts of the District Security Committee to mediate the land crisis in Malen. There are unconfirmed reports that SOCFIN has suspended all female employees involved in the protest.